Many have heard the scripture that says, “...the Blessing of The Lord maketh rich...” But, hearing is not enough. You’ve got to exercise your faith in the Blessing in order for it to fully manifest in your life. 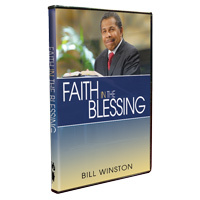 In the new special teaching series “Faith In The Blessing” Dr. Bill Winston shows you how to activate the Blessing of The Lord in your life is through faith. Let the revelation shared in this special teaching help you to get strong and boldly take what God has for you by having and exercising unrelenting Faith in the Blessing!